Reference number for this case: 9-Oct-54-Beauvain. Thank you for including this reference number in any correspondence with me regarding this case. Aimé Michel reports that on the evening of October 9, 1954, an inhabitant of Tessé-la-Madeleine was riding his bicycle in direction of Rhânes close to the pond of Lande-Forêt, which is on the community of Bauvain, in the department of the Orne. The cyclist, Mr. Christian Couette, "was flown overhead by a strange luminous machine which, at high speed, flew at the height of the tree tops". Mr. Couette said that the machine may have measured four meters and resembled "a ball of fire convex on the top." He could observe it during ten seconds. Michel indicates that the testimony was published in the newspaper "Combat" of October 12, 1954, and in the newspaper "Paris Presse" also on October 12, 1954. Oct. 09, 1954, evening. Beauvain (France). Near the Landeforet pool, Christian Carette saw for 10 sec a fiery sphere flying at treetop level. Diameter: 4 m. Protuberance on top. (48;M 152) (Paris-Presse, 12 oct 1954). The author indicates that on October 9, 1954, in the evening, Christian Carette saw during approximately ten seconds, close to Bauvain in the Orne, in the vicinity of the pond of Laneforêt, a sphere of fire which flew at the level of the top of the trees. Its diameter was approximately 4 meters and it had a protrusion at its top. The two authors indicate that in Beauvin in the Orne near the pond of Landeforêt on October 9, 1954 in the evening, Christian Carette sees during ten second a sphere throwing flames and flying at the height of a tree. Its diameter was 4 meters. A protuberance was at the top of the sphere. The authors indicate that the sources are the Vallée catalogue case #218; Paris-Presse for 10/12/1954; Aimé Michel in "A Propos des Soucoupes Volantes" page 190. A speeding sphere streaked low over the treetops near Beauvian [sic] the evening of the 9th. Cyclist Christian Carette had the thing in view for about ten seconds and said the ball-like object had a fiery appearance and some sort of protuberance coming out its top portion. Its speed was terrific. 93. 93. Paris, France. Paris-Presse. 12 October 54. The Belgian ufologist indicates in her catalogue that in 1954, on October 9 in France in Beauvain "In the evening, close to the pond of Landeforêt, Christian Carette saw during ten seconds a sphere throwing flames at the height of a tree. Diameter: 4 m. At the top of the sphere a protrusion." 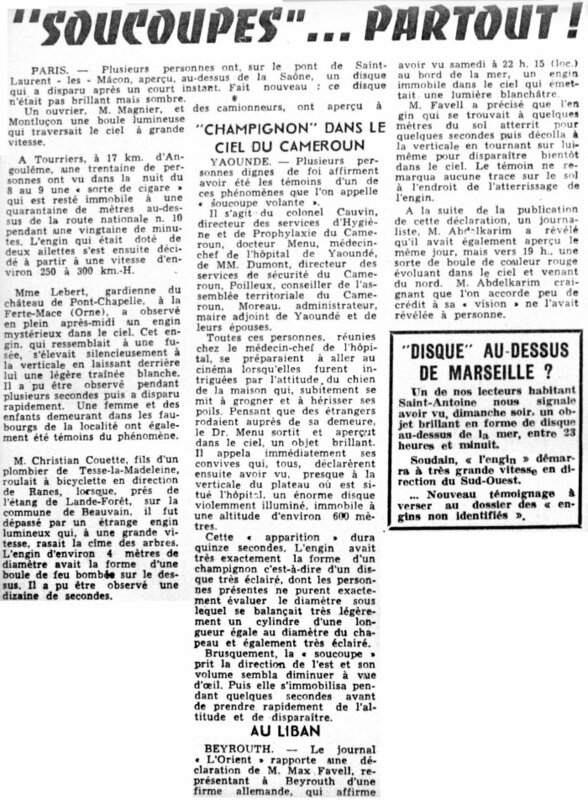 The sources are indicated as "Paris-Presse, 12 Oct 1954" and "Jacques Vallée: 'Chronique des apparitions ET' - DENOEL 1972 - J'AI LU COLL. - p. 272, 273". 1954 - Near the Landeforet pool in Beauvain, France Christopher Carette saw a fiery sphere flying at treetop level for ten seconds. It had a protuberance or dome on top, and was estimated to be about 4 meters in diameter. (Sources: Aime Michel, Flying Saucers and the Straight Line Mystery, p. 152; Jacques Vallee, Passport to Magonia, p. 221). In evening In Beauvain (France), close to the pond of Landefore, Christian Carette sees during 10 s approximately 1 sphere 4 m in diameter throwing flames and flying at the height of a tree. At the top of the sphere, a protrusion. The source is indicated as "Paris-Presse, October 12, 1954". Luc Chastan indicates in his database that in the Orne in Beauvain on October 9, 1954, at an unknown hour, "In the evening, the witness is on bicycle in direction of Rânes when close to the pond of Lande-Forêt he is overflown by a luminous object which shaves the summit of the trees at high speed The object was a sphere throwing flames. Its diameter was 4 meters. A protrusion was at the top of the sphere. It was observed during ten seconds." The website indicates that on 9 October 1954 at 21:00 in Beauvain, France, "Near the Landeforet pool in Beauvain, France Christopher Carette saw a fiery sphere flying at treetop level for ten seconds. It had a protuberance or dome on top, and was estimated to be about 4 meters in diameter." The website adds: "Near the Landeforet pool, Christain Carette saw for ten seconds a fiery sphere flying at treetop level. Diameter: four meters. Protuberance on top." And: "An unidentified object was sighted, but with appearance and behavior that most likely would have a conventional explanation. One fiery ball, about 5 feet across, was observed by one male witness in a pasture for 12 seconds." On October 9 Mr. Christian Couette (or Carette) of Tessé-la-Madeleine (Orne) is flown over by a strange luminous machine which, at a high speed, shaved the summit of the trees". The machine according to the statements of the witness, could measure 4 meters in diameter. It resembled "a ball of fire convex on the top", and could be observed during ten seconds. On October 9 Mr Christian Couette (or Carette) of Tessé-la-Madeleine (The Orne) is flown over by a strange luminous machine which, at a high speed, shaved the summit of the trees". The craft, according to the statements of the witness, may measure 4 meters in diameter. It resembled "a ball of fire convex on the top", and could be observed during ten seconds. *Oct. 9, 1954 - Near the Landeforet pool in Beauvain, France Christopher Carette saw a fiery sphere flying at treetop level for ten seconds. It had a protuberance or dome on top, and was estimated to be about 4 meters in diameter. (Sources: Aime Michel, Flying Saucers and the Straight Line Mystery, p. 152; Jacques Vallee, Passport to Magonia: A Century of Landings, p. 221, case # 218). 19541009 09.10.1954 Beauvain France 07.00 p.m.
[---] Article in the national newspaper Combat, Paris, France, October 12, 1954. [am1] "Mystérieux Objets Célestes", book by Aimé Michel, Seghers publisher, France, page 208, 1958. [am1] "Flying Saucers and the Straight Lines Mystery", book by Aimé Michel, English version of "Mystérieux Objets Célestes", S.G. Phillips publisher, USA, page 152, 1958. [am1] "A Propos des Soucoupes Volantes", book by Aimé Michel, reprint of "Mystérieux Objets Célestes", Planète publisher, France, page 190, 1972. [lg1] "The Fifth Horseman of the Apocalypse - UFOs: A History - 1954 October", monography by Loren E. Gross, USA, page 24, 1991. 0.1 Patrick Gross 26 mars 2003 First published. 1.0 Patrick Gross March 9, 2009 Conversion from HTML to XHTML Strict. First formal version. Additions [go1], [dj1], [jb1], [lc1], [ud1]. 1.1 Patrick Gross June 6, 2010 Addition [le1]. 1.2 Patrick Gross June 16, 2010 Addition [lm1]. 1.4 Patrick Gross October 19, 2011 Addition [oo3]. 1.5 Patrick Gross October 8, 2014 Addition [ni1]. 1.6 Patrick Gross October 19, 2016 Additions [mr1], [ub1]. 1.7 Patrick Gross December 20, 2016 Addition [lg1].